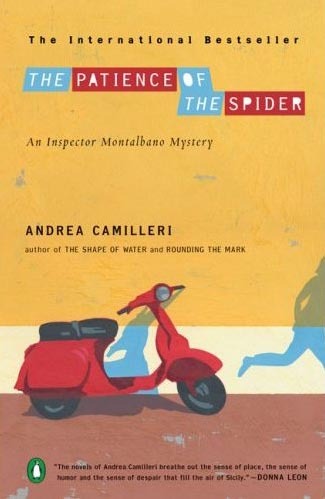 THE PATIENCE OF THE SPIDER is the eighth in the Inspector Montalbano series set in Sicily. Montalbano is recovering from a gunshot wound sustained at the end of ROUNDING THE MARK and his long distance girlfriend Livia is spending some time with him. However he is called back to work when a young woman is kidnapped. The woman's scooter is left behind but there is no trace of her and it's a while before the kidnappers make contact. Though the family is poor there is a rich but shady uncle who should be able to pay the ransom. However what appears at first simple becomes more complicated and Montalbano feels that there is something not right about the whole affair. It is always a joy to spend time with Montalbano and his colleagues and THE PATIENCE OF THE SPIDER is no exception. It has to be said that the mystery plot is not very taxing but the humour and Montalbano's musings on life and politics are as enjoyable as ever. Indeed this one has more barbed political comments than others I've read before. As always the notes by the excellent translator, Stephen Sartarelli help explain the Italian cultural references. THE PATIENCE OF THE SPIDER might not be the best starting place for this series as it might be better to 'know' Montalbano to better appreciate what he's going through mentally in this book. These books are such quick reads and such fun, just start at the beginning with THE SHAPE OF WATER and you'll be at this one in no time. Read another review of THE PATIENCE OF THE SPIDER.